We drove to Singapore :) and stayed at uncle CL's home @ Bishan. It's our first time staying over there. I thought it would be good for EnHui to spend time with their cousins, Yan & Wai, and uncle CL & Aunt B. EnHui were so happy seeing Yan at the door! :D They played with Yan like old friends. It amazed me to see how EnHui could be so at ease with their uncle, aunt and cousins, as EnHui sees them only once a year, on the first day of CNY! for a couple of hours. Christmas, our favourite season of the year! En rolled on the clean ground ! EnHui love cat! and have been asking us for a pet cat. MT & her family were in Singapore as well. We decided to meet at night safari on christmas night. Yan tagged along. Lo and behold, night safari was so crowded! I have not seen such huge crowd for a long time. We being homeschoolers, got the privilege of visiting places during the non peak period. Despite that, I was so thrilled meeting MT and KC, Mun and Lum. En had conversation with aunty MT :) over dinner ! We watched a Thumbuakar Tribe Performance near the entrance. EnHui 's eyes were glued to it, seeing the tribe blew fire and ate it, and danced. We could felt the heat of the fire and were sweaty. En asked "How they did it?" After being pushed into the entrance by the crowd, we started with a short rainforest walk. It was pitch dark and Hui was scared, hanging on me tightly. We walked like a bat out of hell and never stopped till we reached the suspension bridge. En likes crossing suspension bridge and this time, she got to cross it under dim light. We were so relieved to get out of the blackness walk. Seeing the long line for the next show, we jumped in without much thought. We queued for an hour+ !! to watch the night safari performance. I must say, it's worth the wait. The performance was admirable. Unfortunately, Hui was having a temperature. We had to leave after the show.. without visiting the animals in their habitat. Early in the morning, aunt B took us all to "Jacob Ballas Children Garden". Uncle CL stayed back to cook lunch. He is a super excellent chef. We have been eating yummy home-cooked food since we arrived! with dessert (Creme Brulee and Baked Cheese Cake). Friday Day 5 (Last day) . At the end of the fourth day, my energy was running low.. :) Today is the last day in Ipoh. Aunty Po Po has woken early and bought us some heang peah, kuih bangkit and kaya puff to bring home. :) So thoughtful and sweet of Aunty Po Po. En said "Thank you Aunty Po Po" before she left home. Aunty Po Po told her to come again. I took Jalan Sultan Azlan Shah and turn right to Jalan Raja Dr Nazrin Shah. From here, I took exit E1 and back to Simpang Pulai toll. We decided to stop by Gua Tempurung on the way home. We exited Gopeng Interchange. At the T junction, we could see the Gua Tempurung sign, turn right. About 5km, turn left and we reached Gua Tempurung in about 2km. What did Han and Hui talk about! ? There are 4 different tours available. We took Tour 1 Golden Flowstone, the shortest one that took about 40 mins. For safety reason, there was a tour guide who brought us into the cave and provided us with information of the cave. We climbed over 200 steps and stood at the heights of 90metres at the top. We were shown all sort of images resembled on the cave wall. En said 'she could see all the images'. Hui also nodded. The cave interior; its sight, colour, smell, and sound are so great! Being a novice in caving, Gua Tempurung is a real eyeopener. En wanted to go further into the cave.. . We will go again one day. After the breakfast, we went to Gua Tambun, which has the largest prehistoric rock paintings drawing! And we need to climb 141 steps before reaching the cave. It is located behind Caltex Station at the turn off from the main traffic junction leading into Tambun. En is looking forward to it. She likes everything about the stone age - ochre drawing, stone ager etc. Once at the National Musuem in KL 2009, she stood by the stone ager cave for so long. The interest started after En did an activity book on "The Savage Stone Age" by Horrible Histories Scholastic. We parked our car at the Caltex station and walked on the short pathway beside Caltex. At the end of it, we reached a field which was blocked by a locked, low fence. There is a Gua Tambun signboard next to it. Feeling a little anxious, we climbed over the fence and walked across the field. When we reached the end, we saw the second Gua Tambun signboard and another locked fence. (photo below). We didn't dare to proceed further after that. After the red fence, is the quiet narrow pathway that lead to the cave! I explained to EnHui that it was unsafe to go in. Hui kept asking why. ! En was bit dissapointed and she was back to her joyful manner the next minute! Next to the field, we saw stables that cater to the horses at the nearby polo ground. From the stable, we could see the side of Gua Tambun which is simple stunning and exquisite. 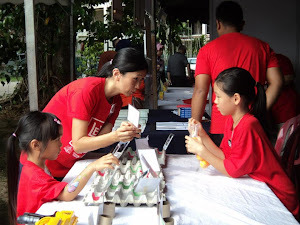 After that, we met up with Aunty M, YL's SIL and she led us to D R Seenivasagam Park, Jalan Dato' Onn Jaafar. There is a bigger Japanese Garden here compare to the one at Jalan Raja Dihilir. En was looking forward to seeing more bonsai. Unfortunatey, it rained shortly after we arrived. 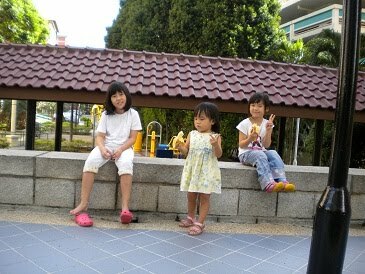 En asked "Mummy, can you bring me to this playground again when we come to Ipoh? " Ipoh Riverfront Park was the next destination. It's located beside the kinta river @old town side, on the left along Jalan Sultan Iskandar Shah. 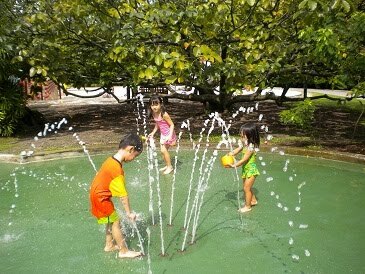 There is a children playground, pool with fountain and a mamak restaurant. *The food is spicy. Fai, Han & Hui in one of the cleaner pool. We usually go to the pool 1-3 times a week. EnHui take joy in it. They will be jumping and dancing happily each time they go to pool. En brought two "plastic pole" which is part of the babygym that was broken. En was skiing in the water with the babygym stand! This part is extracted from John Holt's book "How children fail"
"Children cannot learn much from cookbooks, even the best cookbooks. A child learns, at any moment, not by using the procedure that seems best to us, but the one seems best to him; by fitting into his structure of ideas and relationships, his mental model of reality, not the piece we think comes next, but the one he thinks comes next. The more aware we are of the structural nature of own ideas, the more we are tempted to try to transplant this structure whole into the minds of children. But it cannot be done. They must do this structuring and building for themselves." The babygym was a gift from aunt Ling when En was born. It was broken by EnHui! En said 'Keep it, I can fix the gym'. En tied the stand with the pink ribbon. And of course, it couldn't stand for long! :) It collapsed and En requested to keep the broken gym. Guess you know what contributed to the broken gym! EnHui went to the pool. It's quiet on the weekday and usually we are the only one there. :) Hui kept splashing water with all sort of things that they have brought. She walked from left to right, back and forth, couple of times. When she has satisfied with it, she changed to another tool and did the same thing again. I wonder what's on her mind? En used the tumblers as flippers and row with the funnel ! This part is extracted from John Holt's book "How children learn"
"Children do not need to be made to learn, told what to learn, or shown how. If we give them access to enough of the world, including our own lives and work in that world, they will see clearly enough what things are truly important to us and to others, and they will make for themselves a better path into the world than we could make for them"
We intend to go to the Lost World of Tambun but it only opens at 11am. So, we stopped by the Japanese Garden @Jalan Raja Dihilir to have our breakfast, pastry that we bought from Jusco yesterday and fruits. Thanks to YL for buying fruits throughout the journey. The Japanese Garden has a clean and serene landscaping. There is a pond with koi fishes. When we arrived, the gardener was watering and feeding plants with fertilizer. Hui saw the tiny little fertilizer and asked "what is this" ? The gardener passed some fish food to the kids. They fed the fishes happily. And again, Hui picked flowers. She said " I love flowers". Entrance and parking is FOC. *There isn't any w.c in the garden. En's unfinished bag 27 Jan 2010. Top - handle. Bottom - bag !! It's began to get bored waiting for the Lost World to open.. :( There is nothing much to see in Giant and Tambun town. Tambun is famous of its sweet pomelo but I didn't see any pomelo stall. Lost World of Tambun is located right after Giant. After getting our tickets, we went straight to the petting zoo. At the entrance, we bought different kind of food for different animals. We fed raccoon, rabbits, fishes, parrots etc etc. There is a tiger show. *Please check the show time. En said "It's heavy!" when the wooden container was loaded full of seeds, was full of birds! She always asks 'Mommy, how do I hold a bird? It flies away when I get near it"
En loves to hold cat, dog, cockroach, tortoise, rabbit and now a kid! EnHui enjoyed themselves tremedously at the petting zoo, touching and feeding the animals. :) We went to the restaurant for lunch and the choices are limited. :( After the lunch, EnHui sat on the merry-go-round and followed by water play !!! There is an area that is filled with hot spring warm water. It's great to soak in there when we were cold! I had a great fun playing in the water with EnHui, Fai and Han. EnHui said "I am so happy, mommy is in the water ! lol " It's so joy-rising for me, seeing the smile on each of their faces. En loves the sand but Hui can't stand her feet covered with sand! Aunty Po Po brought us to a famous rice roll “chee cheong fan” for breakfast @Taman Canning. The sweet sauce is maroon in color. It’s plain with just the rice roll. En said “It’s not nice” but she finished it. I am always thankful that En is not fussy with her food. After breakfast, we went to Geological Musuem at Lorong Hariman. Over here, one can see the best collection of cassiterite in the world, collection of fossils, precious stones and over 600 samples of mineral. Unfortunately, when we arrived, it’s closed for renovation. En told me she wish to visit it one day. 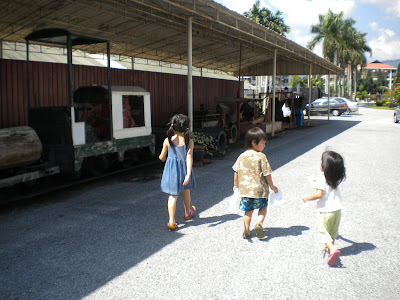 We head to Darul Ridzuan Musuem at Jalan Panglima Bukit Gantang Wahab. Parking and entrance is FOC. EnHui fiddled with all the things in the musuem. We are the only group over there ! YL saw a dead cockroach inside a huge flower pot. The kids got excited with it. En picked it with her hand ! eeeyykk! She loves cockroach! Our first stop was Pun Chun Restaurant @Bidor town for lunch. It’s famous of its duck noodle soup cooked with herbs, dried longan, wolfberries and ginger. The soap is yummy and the meat is tender. For this round, we just ordered wan tan noodles and continued our journey after filling our tummy. 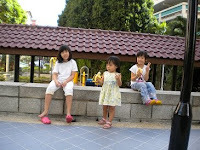 We exited at Simpang Pulai toll and head to Taman Canning, the home that we stayed. 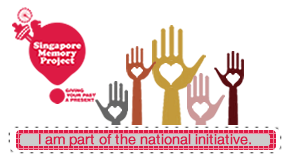 It’s easy to locate using the Ipoh Map. I would just parked by the road side when I read the map. The house is spacious and cozy. Aunty, whom EnHui called Aunty Po Po, provided us with great hospitality.We love that home. I love that home. EnHui love the garden and the swing. 8 of us slept in a huge room. What an experience for EnHui to stay over at Aunty Po Po ’s home with so many people. 4th night - Crack the Maze! After unloading our luggages, we went to Kek Lok Tong. Aunty Po Po tagged along. I am so thankful that she came with us, showed me the shortcut to Jalan Raja Musa Mahadi from Taman Canning. There will be sign leading you to Kek Lok Tong at this road. When we followed the sign, it led us through the Gunung Rapat housing area before we arrived at Kek Lok Tong. Parking and entrance at Kek Lok Tong is FOC. It is a beautiful limestone cave that lead you to a park behind the cave. After that, Aunty Po Po suggested us to go to Polo Ground (Taman Rekreasi Sultan Abdul Aziz) for an evening walk and playground before dinner. The jogging path is full of greens and nature sights. EnHui love the equipments! En and Fai were busy collecting twigs and carried them to the top, building something. Hui checked the ground, found a dead crushed insect and did what she likes the most, picking flowers. We saw two squirrels on a tree. En picked stones and some tiny little things that look like pinecone. All these little stuff on the ground is like a big treasure for EnHui.
"" One day in the Public Garden I see, on a small patch of grass under some trees, a father and a two year old girl. The father is lying down; the little girl runs everywhere. What a joy to run! Suddenly she stops, looks intently at the ground, bends down, picks something up. A twig! A pebble! She stands up, runs again, see a pigeon, chases it, suddenly stops and looks up into the sunlit trees, seeing what? - perhaps a squirrel, perhaps a bird, perhaps just the shape and color of the leaves in the sun. Then she bends down, finds something else, picks it up, examines it. A leaf! Another miracle. Gears, twigs, leaves, little children love the world. That's why they are so good at learning about it. For it's LOVE, not tricks and techniques of thought, that lies at the heart of all true learning. "" Never underestimate the park and playground!